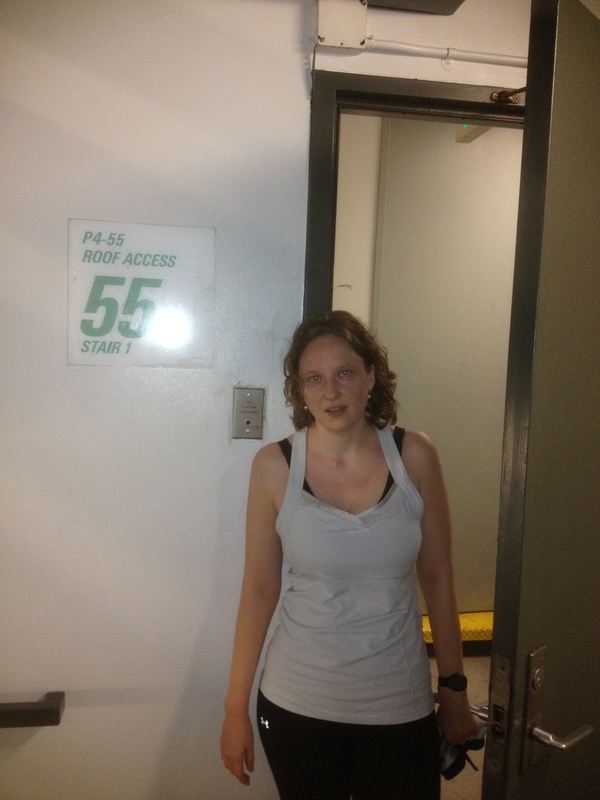 Today was yet another practice climb at the Wells Fargo building in downtown Los Angeles. I went downtown with Morgan from my office. With less than two weeks to go until the race, we want to get in as much practice as we can. Like last week, I still think I should be able to make it up to 55 in 8:40. This time, I adjusted my projected split times to account for the fact that I tend to slow down on the upper floors. I adjusted the lower times downward in an effort to take the first half of the building a little bit faster in hopes that I could then make it to the top on schedule. My first time point was at 12, and I was five seconds ahead of schedule. This was good. The second was at 25, and I was just a couple seconds ahead. By 35, I was on schedule. I lost a few seconds around 38 when there was a guy who wouldn’t get out of the way, and he forced me to pass him on the outside, taking the long way around. That threw my stride off, and I ended up on the wrong foot for the next landing. So I had to take an extra step to get back on the pattern. At 45, I was about ten seconds behind schedule, but I was hoping to make that up in the final sprint. At 51, I started going a bit faster, and at 53 I broke into a run for the last two floors. 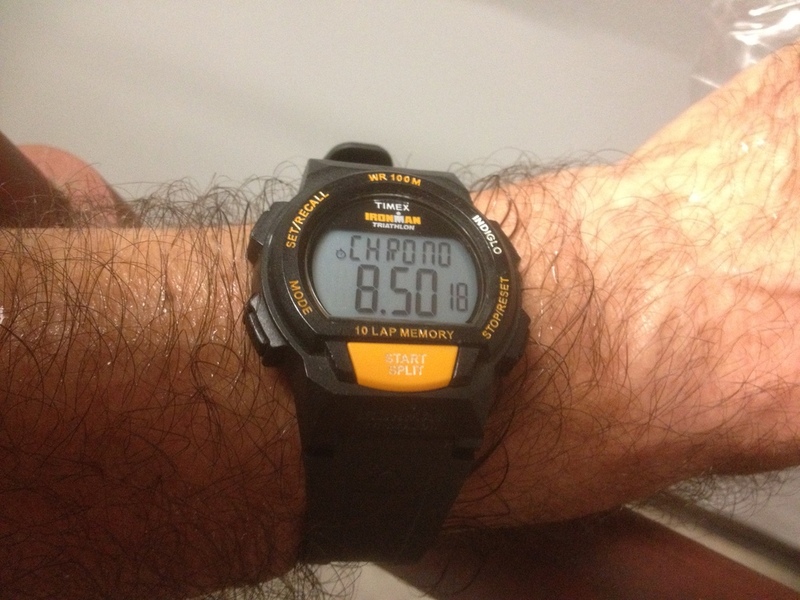 I heaved myself up on the landing at 55, and I saw 8:50 on my watch. So I didn’t make up any time those last 15 floors, but I didn’t lose any more either. And it’s still a new best time for me on this staircase, so I really can’t complain, even if it is only by one second. After a little rest, we headed down to the lobby for a second time up. I always take the second time slower. Along the way, I tried to explain my theory of using an efficient stepping pattern to minimize wasted steps, and also to always hit the turn on the landings on the outside foot. I ran my watch the second time, but I wasn’t really trying to go fast. 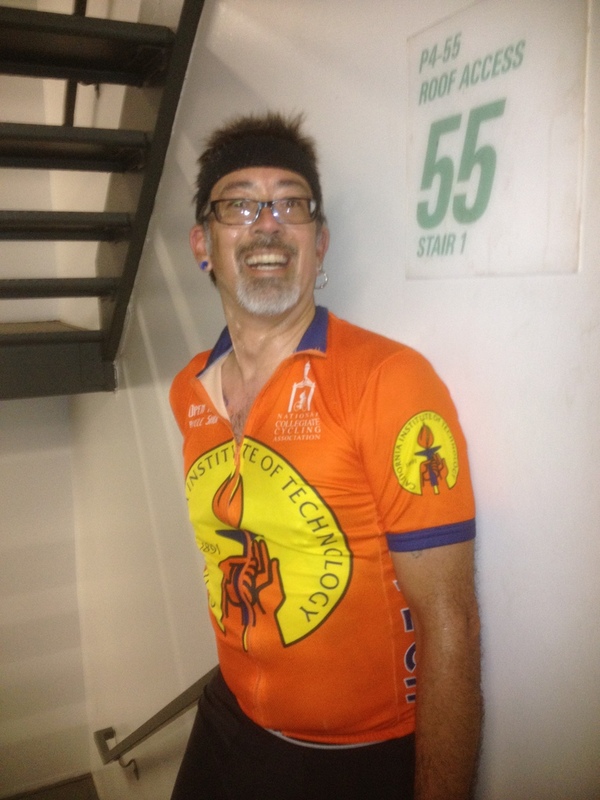 I got to the top in 11:35, which I guess isn’t bad for just loafing along up the stairs. It was a good outing.